Vatican City (Agenzia Fides) - "The first formation Course for formators established by the Congregation for the Evangelization of Peoples, in collaboration with the Pontifical Urbaniana University, is part of the setting and preparation for the Extraordinary Missionary Month announced by Pope Francis for October 2019. 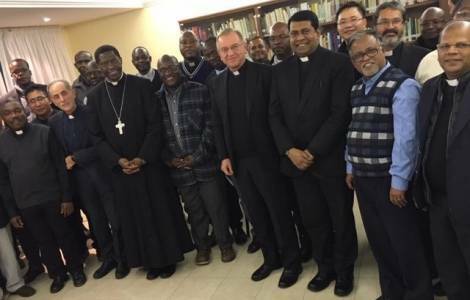 The course intends to contribute to nourishing the spirit and the missionary passion in young Churches, in the five continents": this is what Archbishop Protase Rugambwa, Secretary of the Congregation for the Evangelization of People said to Agenzia Fides, who presided over the inauguration of the initiative, bringing the greetings of Cardinal Fernando Filoni and of all the Superiors of the Congregation. 25 Rectors and vice-Rectors from the Seminaries of the five continents participate in the course. "We are convinced that the future of the Church depends on the quality of its priests", the Archbishop explains to Fides. "This is why our Dicastery considers formation, especially priesthood, as a priority, and is strongly committed to supporting not only formators but also the formation structures in mission territories. This happens through different modalities: the visits of the Prefect to the Seminaries on the occasion of his travels; the action of the Pontifical Society of St. Peter the Apostle; the service carried out by the Pontifical Urbananiana University to affiliated Institutes". In Rome, the commitment of the Congregation in the field of formation is expressed through the Pontifical Urbaniana University and 5 colleges that host students from five continents: the Urban College for seminarians, Saint Paul, Saint Peter and Saint Joseph College for priests, and Mater Ecclesiae College for nuns. "The decision to start a formation course for formators - continues Mgr. Rugambwa - is in continuity with the refresher course dedicated to the professors of the major Seminaries and Institutes affiliated to the Pontifical Urbaniana University, started since the academic year 2012-2013. Now, continuing to address the first semester (October-February) to the professor training course, it will reserve a term (mid-February-mid-May) for the formation of formators". The Archbishop explains to Fides the triple objective of the course: "Offer adequate preparation to take on the direction of a Seminary; strengthen formation skills; to update the participants on the challenges and current needs of priestly formation. To this end, we propose a program that includes master classes on various aspects of formation, but also practical exercises and group work with exchange of experience". Addressing the Rectors and vice-Rectors present, Mgr. Rugambwa, who also celebrated an inaugural Mass, said: "The future of the Church in Africa, Asia and Latin America is in your hands. You have an important responsibility to give your dioceses worthy priests, well prepared on a human, cultural and spiritual level, capable of carrying out evangelization. Today we need to form priests according to the heart of God, that is, priests who reflect a living image of Jesus Christ, Head and Shepherd of the Church".